Pescadero is hard to get to and has the distinct honor of having a county jail site within its borders. Mostly it has lots of tall trees and shade, which makes it a great summer hiking option. Could be Tuesday before I get a hike write-up posted; I’ve taken on a part-time job that will soak up some of my blogging time ($35 an hour vs. $35 a month is compelling math) but the paper keeps paying me to hike, so I’ll at least find time to write up my scouting missions for the paying gig. Tom, where’s the PT job at? Ann: can’t go public with it, it’s covered by an NDA. Tom, at least you get paid to hike – that’s a major step forward. We’ve been section hiking the pct – 1675 miles so far, so we are putting in a lot of driving miles in spring and summer. $4 per gallon is beginning to hurt. First one I’ve ever seen while backpacking. 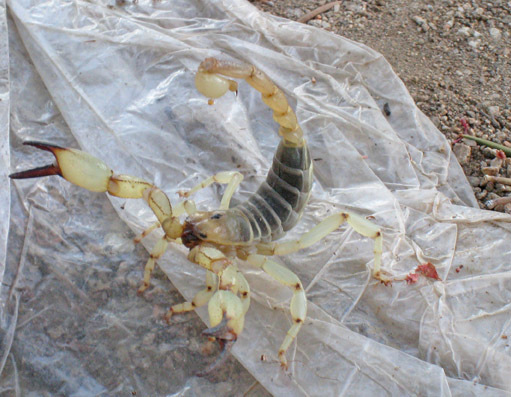 ralph: that is one bad-mutha of a scorpion!